Ayusa International is currently seeking volunteer U.S. host families in Wisconsin interested in hosting a foreign exchange student for the upcoming 2015-2016 school year. One of the main reasons we host students is because they bring so much laughter and life to our home ... They help us see the world through different eyes." 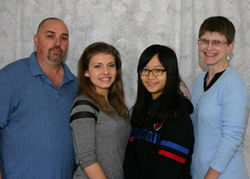 Ayusa International, a non-profit organization that has promoted global learning and leadership through high school student cultural exchanges for more than 34 years, is kicking off its annual search for families in Wisconsin interested in hosting international students for the 2015-2016 school year.